Progress is something that doesn't always come easy to everyone. There are always people who never want to change what they are doing, or how they do it. Societies and people do change, regardless of whether everyone agrees to let it happen. One man who would prefer a simpler life is Sergei Kravinoff, and he would rather be a hunter in an age that has passed. Sergei was born into an aristocratic Russian family a little after the aristocracy had become anachronistic. Being rich and feeling noble, Sergei decided to take on a hobby and be the best he could. He became a hunter, and through hard work he became renowned as the world's best hunter, and he won a court case to have the show 'Hunter' cancelled because it wasn't about him. The truth is that Hunter just got cancelled because it wasn't good enough, but Sergei was and he took on the name Kraven to sound more dramatic and make it easier for people to spell his name. In order to help give him an edge, he took the shortcut that many people take to try and enhance themselves - jungle potions. These elixirs were from the Belgian Congo and they gave him superhuman strength and speed and diarrhea for three weeks. There is a lesson here - don't drink jungle elixirs to gain an edge or you'll get diarrhea. You'll also come to a bad end, so mark my works (just not with a highlighter). Being able to hunt any animal and easily defeat it wasn't enough for Kraven, so growing bored with animals he decided to turn his talents towards more difficult prey. His eyes turned towards America and the hero Spider-Man, who would fit in perfectly on the trophy wall back at Casa Kraven. He and Spidey battled many times and in the end he was able to defeat Spidey and bury him alive. After that he took on the costume of the spider, defeated a foe Spider-man couldn't and then decided he was better than Spider-Man and had finally defeated him. What do you do when you've achieved your life's goal? 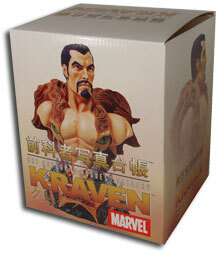 In Kraven's case, quit while you're ahead, so Kraven killed himself. See, you do come to a bad end. Remember - jungle elixirs - bad, suicide - bad. Kraven first entered the scene in Amazing Spider-Man #15, with words and pictures by the team that created him - Steve Ditko and Stan Lee. Since then he's worked alone mostly, but at times he has teamed up with the Sinister Six, all in his effort to defeat Spider-Man. Throughout his life he has appeared in all the Spider-Man books (well, all the real ones if you don't count the ultimate one) and he made his curtain call in a six part mini-series by J.M. DeMatteis and Mike Zeck called 'Fearful Symmetry' (after a line in a William Blake poem) that ran through the three Spider-Man books at the time (Web of Spider-Man, Amazing Spider-Man and Peter Parker). Death in comics usually means you can no longer breathe, but it doesn't hamper more appearances, and Kraven did just that with an epilog to the mini-series. Besides that, the guy is dead. Standing as stiff as rigor mortis (but without the dead guy stink) is the mini-bust of Kraven the Hunter, the fifth entry in the Rogues Gallery series from Diamond Select Toys and Art Asylum. The first four entries were the Lizard, Sandman, Carnage and the Kingpin, and the next three are Vulture, Scorpion and Venom. The line of busts is based around the foes of Spider-Man, though former X-Man Sunfire is scheduled to get the Asylum treatment in this line for an April 2003 release. Kraven is shown not as a particular artist has interpreted the character, but how Art Asylum sees him, which is the modus operandi for all the Rogue's Gallery busts. 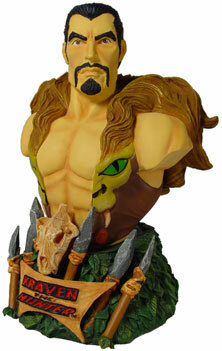 Kraven is the subject of a bust by Bowen Designs, but the scale for the Bowen bust is smaller than that of the Rogue's Gallery. All the Rogue's Gallery busts are scaled to be displayed together, as are Bowen's busts. The Bowen bust includes the belt of Kraven as part of the base design, and DST has chosen to hide that with a more ornate base that is typical of the integrated base designs for this series of busts. 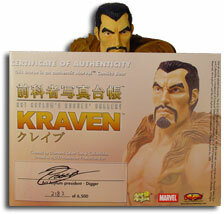 The Rogue's Gallery continues to impress and Diamond Select and Art Asylum have another winner with Kraven the Hunter. Art Asylum designed and sculpted the bust and were aided by Diamond Select in production. Helping Diamond Select are the people of China, the industrious men and women who took a single copy and recreated it 6500 times with all the details there. To keep all these copies safe, they packed them up in space-age Styrofoam inside a not entirely colorful box. The box is white with images of the bust on the sides and abackground information and a design sketch on the back, in the same style as all the Rogue's Gallery busts. The boxes also have Japanese translations for the titles on them for people who like the Japanese language. To make it complete, there is a full-color certificate of authenticity signed by Digger (head of Art Asylum) and numbered by hand. 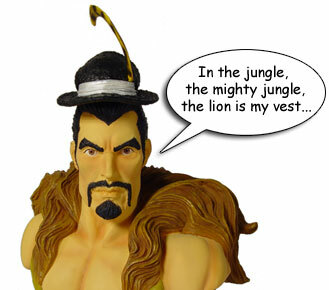 Where to buy the Kraven Bust: This piece is limited to a run of 6500, and you can find it at your local comics shop and various online retailers for between $35 and $45 USD.